Read the title of this horror and you know already what it’s about anyway. Nothing like a good werewolf movie from time to time. Although there’s still a certain shortage of decent films when it comes to this genre. The last (for me personally) successful werewolf movie that I watched, was “Wer“. On the other hand you’ll see some abominably bad attempts like “Wolves” and “Night Wolf“. 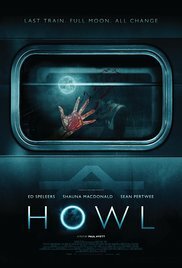 “Howl“, a movie from the UK, may not be as good as “An American Werewolf in London“, but still managed to surprise me. And although it’s a low-budget film, you can say that the look of the creatures terrorizing the passengers of the stranded train was successful. Probably the used anatomy will ensure a bit of protest by the followers of the genre, because it seemed like a mix of a wolf and the creature from “Splice.” But that first attack with a bloody close-up took my breath away. Brilliant makeup and special effects. They looked at least less ridiculous than the furry creatures of “Late Phases” (a movie in which the acting impressed) with their ears decorated with tassels. The progress of “Howl” is well considered and balanced. First a comprehensive introduction of all the characters. The middle section with the threatening situation they find themselves in. Followed by the final confrontation with the necessary victims and a predictable turn. Don’t be surprised when some of the individuals make some stupid decisions again. However, the end might be a little surprising. Unfortunately, the look of the night creatures, when you can admire them in full regalia, isn’t so convincing or frightening. To be honest they looked like individuals who returned from some kind of masked ball. But believe me, the first confrontation was bloody and ruthless. Sheer aggression focused on the terrible creature that struck in a deadly and gruesome way shortly before. Not only the suspense and tension was a positive element in this film. The performances were enjoyable. A collection of colorful characters displaying that typical reserved British attitude. It surprised me they weren’t having a tea break while being attacked by those animals. First, there’s Joe (Ed Speleers), an undervalued train guard, whose life is an accumulation of setbacks and adversities. He is despised by colleagues and passengers see him as an incapable figure. His colleague Ellen (Holly Weston) ignores his romantic moves. Kate (Shauna Macdonald) hated Joe the first instance after she had to pay for a new ticket. Adrian (Elliot Cowan) is a cocky guy who in the end just tries to save his own neck. Nina (Rosie Day) is a spoiled brat. And then there’s this elderly couple, who won’t hide their outrage about the delay, a nerd-like young boy (Amit Shah), an engineer in the making (Sam Gittins) and an obese, lazy football player (Calvin Dean). The introduction sometimes is comical and highly recognizable. Not only the werewolves provide for the eerie atmosphere. But also the location where the train gets stuck with its dark woods and the typical English fog banks, create a creepy mood. The origin of the creatures isn’t explained in detail. Only the older man is aware of other mythical stories about broken down trains and passengers disappearing or being found in a pitiful state. But otherwise, you can only guess where these fast-paced, immensely strong and bloodthirsty creatures come from. Despite being a typical B-movie and the fact that I thought Paul Hyett’s film “The seasoning house” was slightly better, this film is worthwhile to give it a try. It’s not a top film with werewolves as subject, but it certainly is a movie that can compete with the better ones in this genre.